What is your fee structure? Are your services affordable? We can assure you that our fees are very affordable. Because we tailor our services to meet the individual needs and concerns of our clients, each situation is different. Fees are based on the size, age and condition of the home and it's systems. Frequency of visits requested by the homeowner is also a factor in determining fees. We are confident that you will find our fees to be very reasonable. What is the difference between caretaking and property management? Caretaking is ensuring that your property is safe and sound and that all of your systems are operating as intended. A property manager will assist the homeowner in the administration of the home. We will schedule, oversee and supervise the various maintenance, cleaning, and repair persons needed to maintain the home. 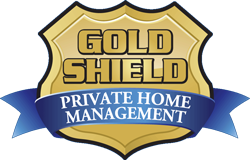 Gold Shield Private Home Management believes in open lines of communication and will accomplish this through phone calls, e-mail or text messaging regarding any issues of concern including utilizing digital photographs coupled with detailed descriptions of those issues. If we ever encounter a problem, we will notify you immediately and will work to remedy the situation at once. How soon can you start managing our home?